As All-American Selections Gold Medal Winner in 1935, Straight 8 is still quite popular today as it is early and highly productive. Vigorous vines produce an abundance of 8x2 inch long, uniform, dark green, smooth, slightly striped, fruit with white spines. Resistant to Mosaic. Plant seed outdoors in late spring when ground is warm and danger of frost is past. Traditionally planted in hills (a small ring of 4-6 seeds). Straight Eight can be planted in rows. The hills and rows should be 4 to 6 feet apart. Cover seed with 1/2 inch of fine soil, well pressed down. Keep moist until seeds sprout. When plants are 2 to 3 inches tall, thins hills to 3 to 4 of the strongest plants. Cucumber Straight 8 can be planted until mid-July. 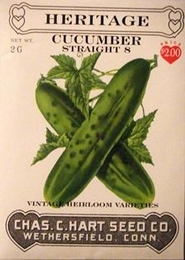 Bulk Heirloom Cucumber seed available. 3lbs of Heirloom Cucumber seed needed per acre, 4oz needed per acre if using transplants. On average, 1oz of seed can produce 800 Heirloom Cucumber plants.